In this edition of the “The Good Stuff,” Dan has notes on Vlad Ducasse, Bill Hughan and Adrian Clayborn . . . 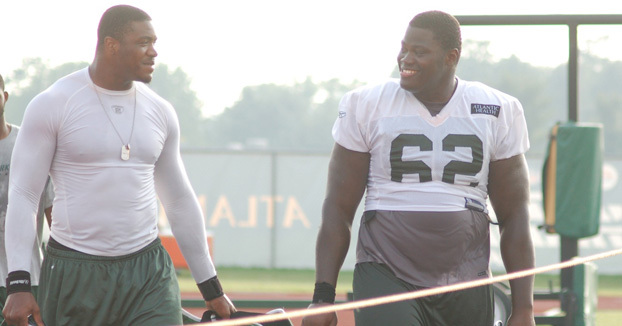 The lockout is really bad for Jets offensive lineman Vlad Ducasse. With the release of Damien Woody, and free agent status of Wayne Hunter, he is the heir apparent at right tackle. This off-season was huge for him. He needed non-stop tutorials from Bill Callahan (and part-time assistant, the legendary Jim McInally). Remember, he’s never played right tackle before. At UMass, he was a left tackle, and then he spent a big chunk of last spring, summer, and fall working at guard. He was battling for the starting left guard spot in the spring and summer camps. He did get some work at right tackle on the scout team in practice during the season, but remember, this really isn’t tackle football. There is minimal contact and no tackling during in-season practices. I’m sure he’s staying in good shape working out in Martinsville, with Bart Scott and company, but he’s not getting the football work he needs. I asked a source close to the Jets, who knows Ducasse, if the lockout his hurting his development. “It’s not helping – that is for sure,” said the source . . . Speaking of Ducasse, Mike Devito was raving about his strength the other day. DeVito feels Vlad is one of the strongest guys on the team . . .
As you all know, the Jets have a new conditioning coach. His name is Bill Hughan. He came to the team after three seasons as the assistant conditioning coach for Atlanta, and before that he held the same position with Oakland. He’s in a tough spot right now. 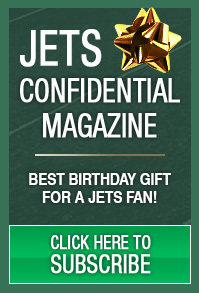 In his first year as the Jets conditioning coach, there is no off-season conditioning program, due to the lockout. He doesn’t know most of the players on the roster. This off-season would have been a great time for him to get acclimiated and comfortable with the guys he is training. And if some point, when DeMaurice Smith finally decides to negotiate, and the CBA is resolved, the players are going to get in real late, and it’s going to be tough on Hughan. He’s going to be pushing guys he doesn’t know. Sal Alosi knew the players inside and out. He knew how to push the buttons of different guys. That is so important in the weight room. This is a bad off-season to be indoctrinating a new conditioning coach. One factor that will help Hughan get a feel for the cast of characters he has to deal with, is the team retained Alosi’s assistant Bryan Dermody. He can fill Hughan in on a lot of helpful information on the various players. But right now, the two of them are sitting around the weight room like the Maytag Repairmen, with nothing to do . . . I met Iowa DE Adrian Clayborn at Sirius Radio last Saturday. The first thing that hit me about him, was he’s not very tall – about 6-2. At 6-2, and around 280, he’s not built like a 3-4 end. And he’s not fast enough to be a 3-4 outside linebacker. But you know what, he’s a heck of a football player, and if he slips to 30, the Jets have to give him a long hard look. As a junior, he had 20 tackles for loss, 11.5 QB sacks and four forced fumbles. As a senior his numbers were down. The reason he will likely slip is a nerve condition in his right shoulder suffered at birth. He was such a big baby, while the doctors where getting him out of his mother, the injury occurred. But he really hasn’t missed any time because of it.